When you add an identification and start to type in a species name on iSpot, you should see a drop-down list appear that will match as closely as possible to the name that you are typing in. In this case we have started typing in the scientific name box 'Poa' and the dropdown list has appeared so it is possible to select one of the Poa species from the list. A similar thing happens if you type in the common name box. iSpot works best if you can choose a name from the list whenever possible although if you need to use a name that isn't in the list then you have the option of just typing it in. Which species dictionary you will see on iSpot depends on the location of the observation. If the observation is located in the UK or Ireland you should see names from the UK Species Inventory, and elsewhere in the world the names will be from the international Catalogue of Life. When adding an observation it is best to make sure you enter the location details before adding the species name, if you don't do this the dictionary used will depend on which iSpot community you are linked to and this could lead to less good results. Click here for information about iSpot's use of species dictionaries. Using a name selected from the drop-down list gives iSpot the best chance of linking correctly to other information about the species both on iSpot itself and the external sites (such as the National Biodiversity Network maps) that we link to. 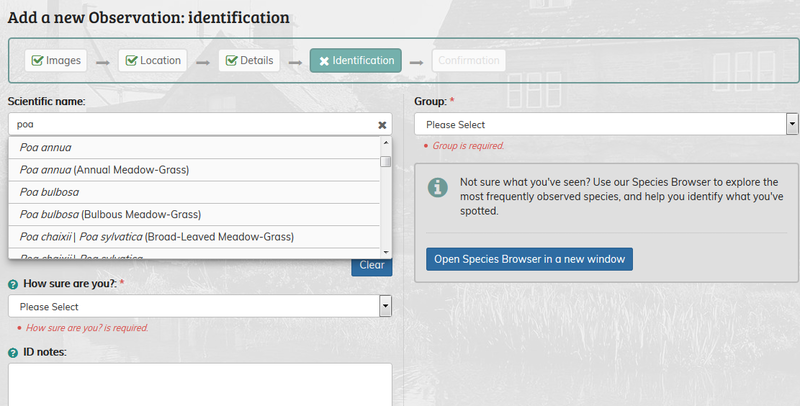 Within iSpot, the use of the name from the list will allow your species observation to be linked in to the taxonomic hierarchy feature, so that you can see how your observation fits in to the scientific classification of species, and see which other species are most closely related. It also means that the observations on iSpot can be passed on to the recording schemes (such as those badged on iSpot) that collate species records - we can only send the record to the correct recording scheme if it has been identified with a name that links to the species dictionary. The list of recommended names and the taxonomic hierarchy have been made possible thanks to the UK Species Inventory project, managed by the Natural History Museum in London. Elsewhere, the species names and taxon hierarchy are based on the Species 2000 & ITIS Catalogue of Life: 2013 Annual Checklist. The content is contributed by an array of some 200+ expert taxonomic databases world-wide, involving over 3,000 taxonomic specialists: the Global Species Databases.